The new AV-over-IP module, Audinate’s Dante AV, makes its debut at ISE 2019 while announcing intoPIX JPEG 2000 technology. The AV-over-IP conversations got more interesting ahead of Integrated Systems Europe (ISE 2019) where Audinate Dante AV module debuted and announced that intoPIX JPEG2000 technology is part of the Dante AV Product Design Suite. 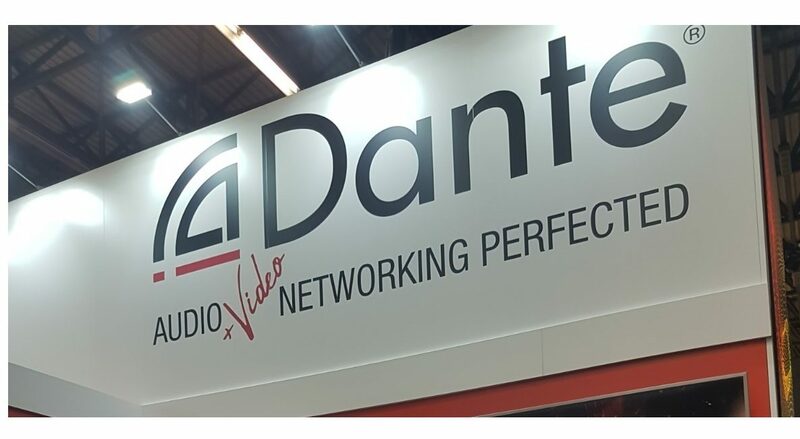 Meanwhile, Dante AV enables interoperability with more than 1,600 Dante-enabled audio products already on the market. Dante AV solves problems of networked video and audio synchronization, utilizing a single network clock for sub-microsecond accuracy. With Dante AV, audio and video signals are independently routable in a single, easy-to-use interface using the Dante Controller software. Manufacturers can also take advantage of Dante API to customize their management user interface. Dante AV solves time alignment issues and eliminates the need for audio de-embedders in applications such as sports bars, live events and multi-zoned AV systems for perfect lip sync everywhere. The Dante AV Module supports one video channel and 8 bi-directional channels of uncompressed Dante audio. The Dante AV Module is ideal for manufacturers creating 1G video-over-IP products and includes Dante control, transport and synchronization. The architecture is completely codec-agnostic, so manufacturers can use the codec of their choice and still get the benefits of Dante. 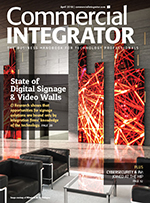 “Customers want us to bring the “V to AV,” says Lee Ellison, CEO of Audinate. While Audinate announced Dante AV just prior to ISE 2019, the intoPIX JPEG 2000 news breaks during the trade show. 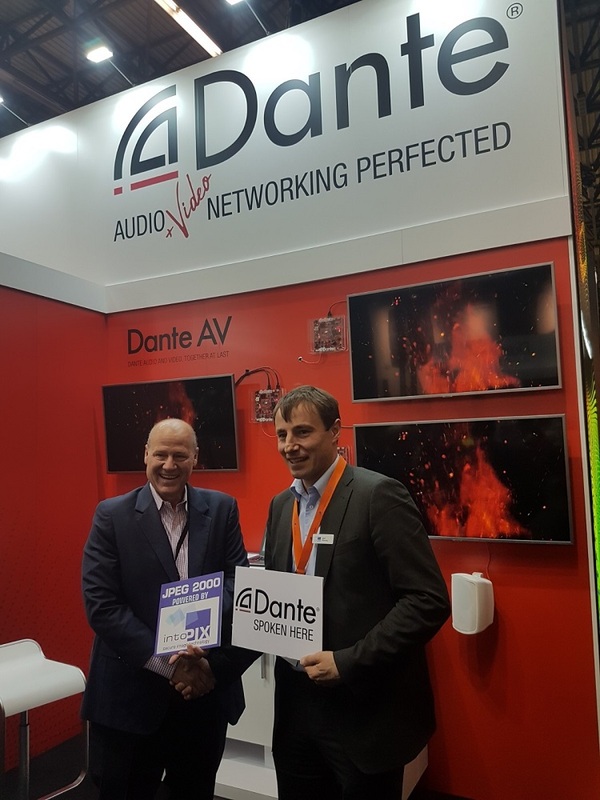 intoPIX (ISE 2019 stand, stand 10 N-199) is a leading provider of image processing technologies for professional media applications and intoPIX’s ProAV optimized ultra-low-latency JPEG 2000 technology will be offered within the Dante AV Design Suite for use with the Dante AV Module. 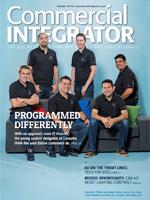 The incorporation of intoPIX’s unique technology plays a crucial role in the system to deliver a visually lossless 4K60 4:4:4 HDR video experience within a standard 1 Gigabit Ethernet network with no latency, according to an Audinate press release. 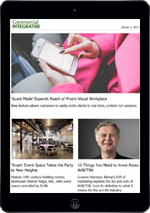 “Unlike normal JPEG 2000 solutions, our codec reduces latency down to 10 milliseconds and is more suitable for Pro-AV content – two features crucial to the industry,” says Gael Rouvroy, intoPIX CEO and director of technology. “Although the Dante AV Module is designed to be codec agnostic, we felt it was in the best interest of our OEM customers to have the codec already integrated as part of the Dante AV Product Design Suite,” says Lee Ellison, CEO, Audinate.